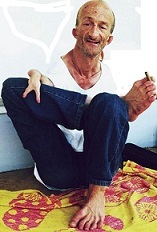 Ninety pound South Beach, Fl artist Jonathan Crenshaw is homeless, armless and for years painted prodigiously with just his feet to the delight of tourists. But last Tuesday around midnight Crenshaw grabbed a pair of scissors from his waistband (using a foot of course) and stabbed tourist Cesar Coronado. Coronado's girlfriend says they were just asking for directions (at midnight). Crenshaw's rap sheet includes trespassing, disorderly intoxication, vandalism, and battery on police officers, firefighters and city code inspectors. But not with a pair of scissors until now. Local newspapers say the artist claims he lost his arms when his mother fed him rat poison. Crenshaw also says Gloria Estefan gave birth to 200 of his children. So there's that too.